7x9-inch ACME Telephoto from an unidentified newspaper's archive (note: distributed by ACME's New York bureau). Plane crashed May 16, 1938; photograph was shot (or at least distributed) May 19, 1938. SAUGUS, CALIF. — The remains of one of the huge wings of the Lockheed Transport plane that crashed into Stone Mountain, 20 miles north of here, while on a delivery flight from Los Angeles to Las Vegas, Nev., is shown in Mint Canyon. The nine persons aboard, two of whom were children, perished in the flaming wreckage. From Aircraft Wrecks: 5/18/1938 [Error: s/b 5/16/1938]. 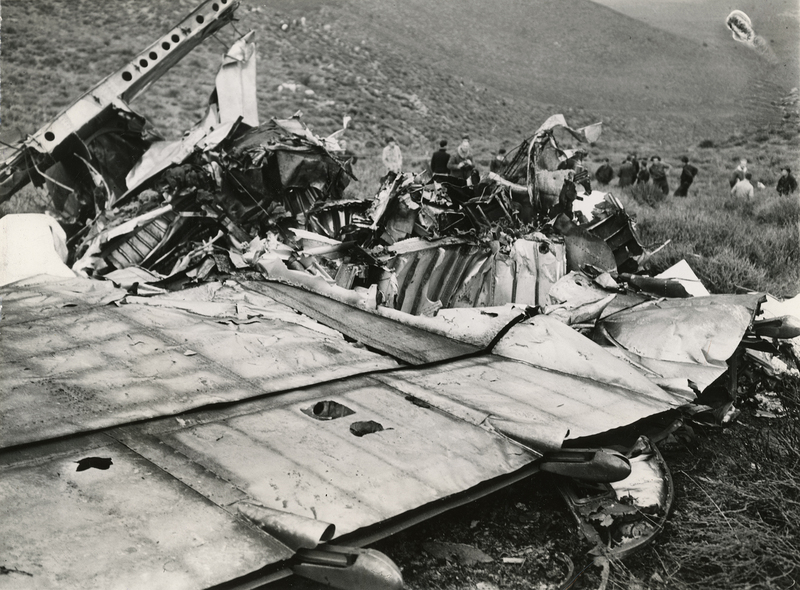 Lockheed Super Electra Model 14H c/n 1439, NC-17394 of Northwest Airlines hit Stroh Peak 1.5 miles north of Mint Canyon Road, killing all nine on board. Bad weather was a factor in this crash. Wreck is mostly removed from its 2,200' impact site. Circumstances: 24 minutes after its departure from Hollywood-Burbank airport, while cruising at night, aircraft hit Mt Stroh located in the Mint Canyon, southwest from Palmdale. Crew was performing a special flight to Las Vegas to show this new aircraft to the president of the company. All nine occupants were killed. Causes: Crew did not follow published procedures and was cruising at an unsafe altitude to overfly the mountainous region. Narrative: Struck Stroh Peak at 3,300 feet in Mint Canyon 27 minutes after taking off from Burbank Airport for Las Vegas and on the way to Saint Paul. The brand new Lockheed was on its delivery flight from Burbank to its new owners, Northwest Airlines. It was being flown by a Lockheed test pilot Sidney Wiley (36) and the vice-president of Northwest Frederick Whittlemore (42), who was a pilot. Flying in foggy conditions it struck the first of a series of ridges and bounced off two others, disintegrating on the way, before coming to rest and burning out on a hill called Stroh Peak. LW2851a: 9600 dpi jpeg from original photograph purchased 2016 by Leon Worden.